When any Filipino film buff is asked to do a rundown of the best Philippine movies of the second golden age and beyond (the second golden age is a term coined to refer to a rather sporadic exhibition of local films from 1974 onwards that are characterized by a strong sociopolitical message or those that exhibit innovative techniques when it comes to filmmaking), one would always recite the Cannes film noirs of Lino Brocka (Maynila, Insiang, Jaguar, among others), the cyclical films of Ishmael Bernal (Nunal sa Tubig, City After Dark, or Himala), or the intriguing allegorical works of Mike de Leon (Kisapmata, Batch ’81, Kakaba Kaba Ka Ba?). Perhaps the list would also have a sprinkling of films by Peque Gallaga, Eddie Romero, and Celso Ad Castillo. The showstopping works of these filmmakers are great indeed. Truly, these films reflect an important milieu in our history as a nation, and they have withstood the test of time. There’s no question there. However, a number of equally brilliant films have unjustly been off the radar of the average film buff. These films are not as celebrated by film critics and film lovers alike. They are often absent in the perennial “Top 10/20/50 lists of most notable films.” And if these films are ever included in such a list, they often occupy the tailend notches in the ranking. They say that the Filipinos love to champion the underdogs. And true to form, this article aims to celebrate the most underrated Filipino films from the 1970’s up until the present time. Any such list is always subjective, obviously. But there is no denying that these films ought to be remembered and discussed as much as the other cinematic greats! 1. Pagdating Sa Dulo by Ishmael Bernal (1971) – This writer cannot believe that a leading website that consolidates an exhaustive list of Filipino film classics did not have this film in its Top 100! Absurd, indeed! Bernal’s debut film is one of those that tackle the art of filmmaking. This movie-within-a-movie focuses on the lives of a taxi dancer and her lover as they are catapulted to stardom – making a mess of their personal lives in the process. The film is unforgettable not only for the tour de force performance of Rita Gomez, Vic Vargas, and Eddie Garcia but also for the poetic screenplay and assured direction of Bernal, who was still a rookie on the director’s chair during this time. Brocka made a similar film a few years after called Stardoom, but it ultimately pales in comparison to the Bernal’s arthouse hit. Who would ever forget the final scene where the characters of Gomez and Vargas ascend the stairs of the moviehouse – their faces showing a bewildered, questioning then defeated look. 2. Sino’ng Kapiling, Sino’ng Kasiping by Eddie Romero (1977) – Romero’s intimate study on the psychology of marriage and infidelity boasts of strong performances especially from Daria Ramirez and Lito Legaspi. Excellent characterization lends utmost credibility to the film’s portrayal of couples who realize that their respective marriages have hit a dead end. The well-written script underscores every person’s need for a sense of purpose and affirmation. Sadly, the film’s excellent acting, well fleshed-out characters, and excellent screenplay were not complemented by the film’s rather dismal technical elements, especially the lousy camerawork. 3. Hubad na Bayani by Robert Ylagan (1977) – This film established Robert Arevalo (Ylagan is his real surname) as an equally good actor/director. To say that this is an important film would be a huge understatement. Set during the 1920’s, it depicts the miserable lives of peasant families who are terrorized by landlords, brainwashed by fanatical cults, and drawn to fight for a cause by rebel groups – depicting an emerging nation brewing with social ferment. The depiction of rural Philippines as a feudal and agricultural wasteland of oppression and injustice is truthful and carefully studied. The ensemble cast is excellent and the film’s scope still rings true up to this day. 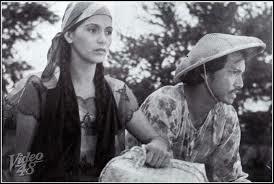 Behn Cervantes made a similar film the year before which he called Sakada. However, Cervantes celebrated work appears too theatrical, slow, and preachy for the contemporary viewer. Here is where the merits of Ylagan’s film lies. Though far from perfect technically, the film as a whole looks and feels more organic, in sharp contrast to Cervantes’ “street-activist” aesthetics. 4. 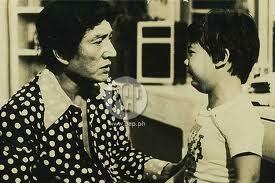 Ang Tatay Kong Nanay by Lino Brocka (1978) – This is perhaps one of Dolphy’s finest films. The Philippines’ comedy king will forever be credited for originating the flamboyant gay in Philippine Cinema – long before Vic Sotto, Roderick Paulate, and Vice Ganda came into the picture. This dramedy stars Nino Muhlach, Philippine Cinema’s child wonder of the 70’s. Dolphy, on the other hand, plays foster father to Muhlach’s amusing and cutesy character. His love for his son and his desire to give his son a normal family life has led him to conceal his true sexual orientation from the inquisitive boy. When he is finally outed towards the end of the film, the concluding scenes will forever be remembered as one of the most poignant and touching finales in Philippine cinema – and in a Dolphy film at that! Dolphy’s pioneering depiction of gays as flamboyant and histrionic is balanced by the film’s quieter moments. Brocka here powerfully merges commercial appeal and artistic integrity. The end product is funny, grounded, affecting, and believable. 5. 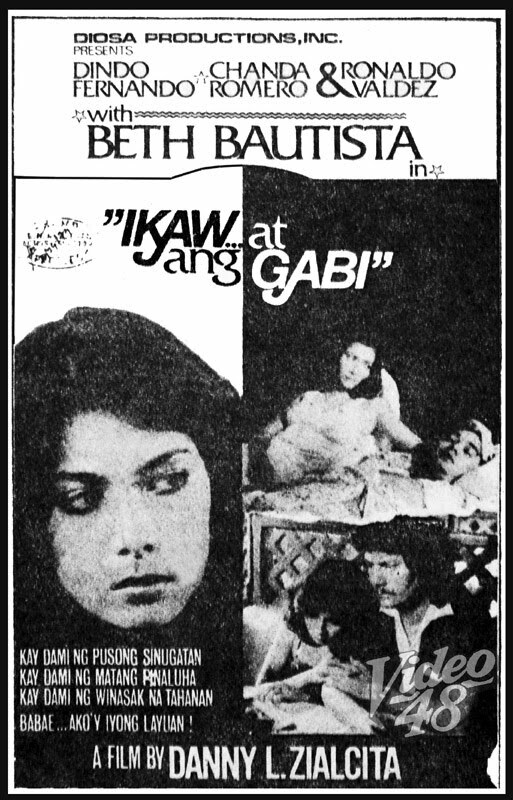 Ikaw At Ang Gabi by Danny Zialcita (1979) – Not until it was later found out that this film was carbon copied from the American miniseries Torn Between Two Lovers, this excellently crafted melodrama features commanding performances from Dindo Fernando and Chanda Romero. An adult tale of failed relationships and broken marriages, this film sort of foreshadows Jerrold Tarog’s innovative Sana Dati. Love in this film that was made towards the end of the 70’s is portrayed in a very unromatnicized manner. It is not in the sweeping saccharine declarations of affection. Rather, it is found in the little things – in acceptance, forgiveness, and the commitment to give it one more try. Sappy concepts it may seem but thankfully, the film does not dissolve in too much pathos. Technical elements are all outstanding (relative to Philippine melodramas that are often convoluted, manipulative, and overdetermined) – from the cinematography to editing to musical scoring.